Love to dream about those swanky bathroom remodels you see in the pages of shelter mags and home decor sites? Believe it or not, all luxe "after's" had ignominious "before's" at one point in their histories. Before-and-after remodel photos are inspiring because they nail home the fact that yes, this can be done. If someone else turned their dismal bath into a place of joy and pleasure, you can too. Kate Arends, founder of lifestyle blog Wit & Delight had a decidedly dreary and uninspiring space in her Tudor-style cottage in St. Paul, MN. She decided to do something about it. 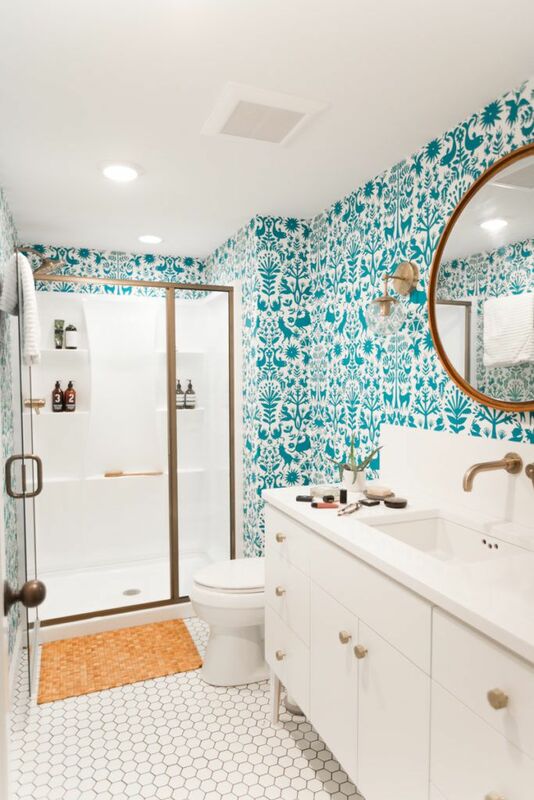 With the help of quartz countertop maker Cambria and its White Cliff™ design, Kate turned her bathroom into a charming, colorful, attention-worthy space. The walls are Hygge & West Otomi Wallpaper in Turquoise. Plumbing fixtures are from the Delta Trinsic Collection. 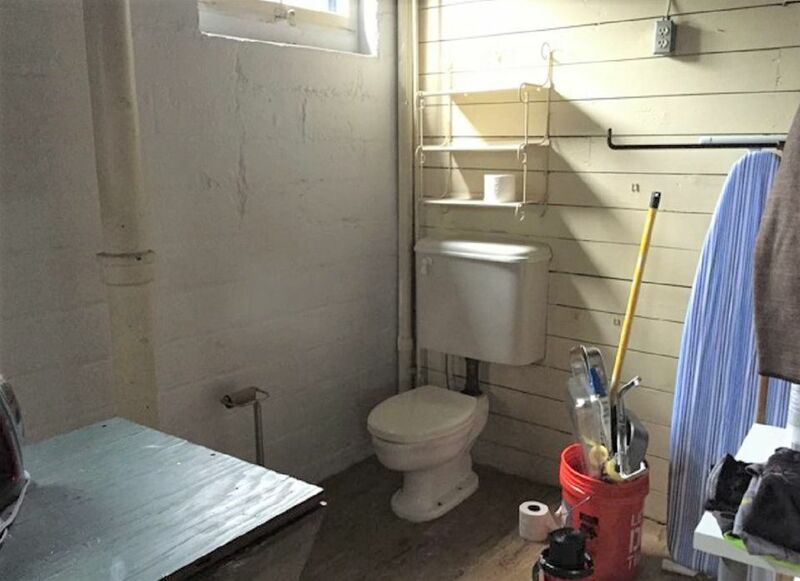 Kristi, over at the design blog Addicted 2 Decorating, was not at all addicted to her dull hallway bathroom. She began by ripping everything out of the bathroom, resulting in 39 contractor bags of tile, mortar, wood, and glass that went straight to the landfill. With the bathroom walls and floor open, Kristi began the bathroom remodel, accomplishing about 90% of it all by herself. While she did hire a plumber, she admits that she could have done the work herself if she'd had the time. This remodel is a case study in DIY. One of Alice Dubin's friends said that it would be, “A crime against Los Angeles,” to renovate her 1930s Art Deco era bathroom. But then again, it wasn't the friend who had to live with the "stinky plumbing and cracked tile," as Alice puts it. Alice completely gutted the bathroom but did what is commonly called a "​sensitive remodel:" retaining the feel of the original while updating it functionally. The result is a light-filled bathroom with vintage-inspired floor tiles, subway tile, a Caesarstone tub and countertops, frameless shower and tons of other fantastic touches. In the end, Alice rhetorically asks, "Was our 1930s bathroom remodel a 'crime against Los Angeles' or a respectful upgrade?" Definitely the latter. When ReBath of Illinois was contracted to remodel this bathroom, they were confronted a conundrum. It was a fully functioning bathroom that basically had nothing wrong with it except for one thing: it felt drab and dated. What to do? Rebath of Illinois made the bathroom feel airier and lighter by switching out the old pre-fabricated stall-style shower with a frameless glass shower. Frameless showers allow a maximum of light to pass through—a bonus for small spaces. When TrendMark Inc. was brought in to renovate this bathroom, they were confronted with a space that was stylistically too busy, cramped and imposing. Major changes had to be made. It was obvious that this room needed a style intervention. Trendmark totally revamped this bathroom, from floor to ceiling, installing white subway tile and a frameless glass shower. One unexpected but welcome spot of color is provided by the vintage stained glass window insert. A cheerful paint scheme completes the look. Jen Pinkston from the decor blog The Effortless Chic found her bathroom to be lacking in color, to put it mildly. As she says, "Pretty fancy, right? Sooooo much white and not in a good way." White upon white with gold touches was a fashion in the 1980s and 1990s. Jen added sorely-needed color to her master bath remodel in the form of blue hexagon tile from Fireclay Tile and a runner from Lulu and Georgia. The "before" bathroom in this two-story 1930s row house in San Francisco featured tile with an unusual shade of green. Can it be fixed without breaking the bank? This remodel came in for well under $5,000! One way to do a bathroom cheaply is to purchase stylish but cost-effective building materials. The tile shown here is Daltile Rittenhouse Square 3" x 6" White Tile from Home Depot. Michael Gorman had a couple of things going for him with his upcoming bathroom remodel. First, it was located in a large, open area in the basement. Second, nothing had to be demolished. Beyond that, this dark, scary basement needed a lot of help to make it habitable. Gorman punched windows into the basement walls to add natural light to his new bathroom. A slipper tub turns a utilitarian bathroom into a place to relax and luxuriate. Classic flamingo-pink tile from the 1950s was not this owner's style, so they hired Sonnenburg Builders to eradicate the pink and update the bathroom. The bathroom received major warming touches in the form of light-color natural wood cabinets, gray countertops with an undermount sink and a large mirror. This century-old house had impressive bones. The only problem was that the bathroom did not honor the home's distinctive style. The owner brought in Morris Black & Sons, a Pennsylvania design firm. They completely redid the bathroom and added a frameless glass wall shower with multiple shower heads. The natural ​stone shower wall is a nod to the house's 100-year-old past and its extensive stonework. Blue is a wonderful color. It works for skies and oceans. But bathrooms? Not so much. The short period of time when blue bathrooms were in vogue is no more. Allison and Jovito Pagkalinawan's century-old Brooklyn brick row house deserved better. Not only did they feel that blue itself was not right for a bathroom, but it also was not period-appropriate. As part of a whole-house remodel, they went through the contractor matching service Sweeten and found a company they felt was perfect for their needs. Because Allison and Jovito's bathroom was small—a mere 36 square feet—they chose white as the dominant color. White reflects more light than any other color and makes small spaces feel larger. To align with their home's period (1910), they chose subway tiles for the entire bathroom, a clawfoot bathtub and a pedestal sink. Gleaming chrome towel bars and fixtures dance with light. The result is a comfortable, fresh bath remodel that honors their home's pedigree.